On his last full day in New York City for the 1960 Assembly meeting, Soviet Premier Nikita Khrushchev took offense to the words of a delegate from the Philippines who claimed that Eastern Europe had been "deprived of political and civil rights" and had effectively been "swallowed up by the Soviet Union." What happened next has been debated, but William Taubman, author of Khrushchev: The Man and His Era writes that after banging a table with both his fists, the Soviet leader took off his right shoe  a loafer or sandal, according to Khrushchev's son, because he hated tying laces  waved it and then "banged it on the table, louder and louder, until everyone in the hall was watching and buzzing." Afterward Khrushchev was said to have remarked, "It was such fun! The U.N. is sort of a parliament, you know, where the minority has to make itself known, one way or another. We're in the minority for the time being, but not for long." 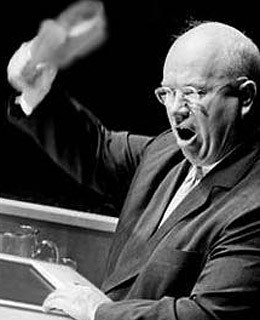 The incident is so often associated with the United Nations and the General Assembly, Taubman says, that the most frequent question asked of U.N. tour guides is, "Where was Khrushchev sitting when he pounded his shoe?"